Ukrainians have demonstrated their determination to turn their backs on their communist past and be part of the western spirit of democracy and freedom, writes Peter Van Loan. Vladimir Putin’s recent actions represent the greatest threat to security in Europe we have seen in some time. The Russian military occupation of Crimea and the transparent involvement of Russia in efforts to destabilise Ukraine are serious, but they represent a troubling approach to advancing Putin’s perception of Russia’s national interest. With the echoes of his Georgian military intervention still fresh, the Russian’s latest actions point to efforts to reverse what he calls the greatest geopolitical tragedy of the 20th Century — the collapse of the Soviet Union. All his actions are steps on the path to restore that empire. In this context, the need for a firm, principled and decisive response from western countries is fundamental if Putin’s ambitions are to be contained. Canada continues to show leadership in individual and multilateral actions in response to Russian actions. In a free and democratic West, continued public and media attention to Putin’s actions, and public support for a firm reaction, will be key elements in a successful response. The broader threat to the region is clear. 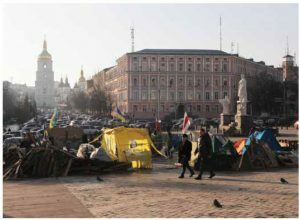 The Putin regime’s military aggression and illegal occupation of parts of Ukraine continues to threaten the stability and security of Central and Eastern Europe and the rule of law between nations. Those actions clearly contravene the overriding principles of liberty that Europe has worked so hard to move forward since the era of the World Wars and especially the end of the Cold War. Ukrainians have strived to move in the same direction. They have demonstrated time and again their courage and determination to turn their backs on their communist past and be part of the western spirit of democracy and freedom in which human rights are respected and the rule of law prevails. 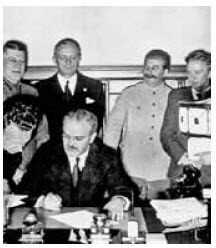 Molotov signs the Nazi–Soviet non-aggression pact. Behind him are Ribbentrop and Stalin. These events in Ukraine are especially troubling for Canada and Canadians, because the relationship between our two countries is a rich and strong one. In 2011, many Canadians joined with our Ukrainian-Canadian community to celebrate the 120th anniversary of the first Ukrainian settlement in Canada. Ukrainian-Canadians have helped build this country and are proud of what has been achieved and contributed. In 1991, Canada was able to acknowledge this contribution in a dramatic and concrete way: We were the first western country to recognize Ukraine’s independence. And we did so on Dec. 2 — just one day after Ukraine had itself affirmed its independence. Since then, Canada has worked closely at the governmental level and informally through community and civil society organizations to help Ukraine rebuild after 70 long years of Soviet tyranny. Recently, Canada pledged more than $220 million in support to help Ukraine stabilise its economy and promote economic and social development. Our government fundamentally believes democratic countries should be free to choose their alliances and associations in the global community. It was the Ukrainian choice to build alliances with a free and democratic European Union that prompted the Russian interference that has propelled recent developments. From the beginning of Ukrainian citizens’ efforts to defend their freedom and sovereignty, our government has been vocal in its support. As Russia has escalated efforts against Ukraine, we have called on Putin to respect international law and commitments. Mr. Putin’s escalation and aggression has forced our government, in co-ordination with our partners and allies, to impose economic sanctions and take actions that have further isolated his regime diplomatically. 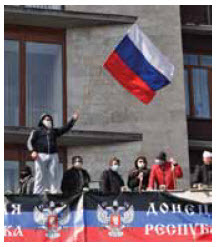 Pro-Russian protesters in the Donetsk People’s Republic, proclaimed April 7. In response to our government’s efforts to stand-up against Russian aggression in Ukraine, I was included on a list of 13 Canadians sanctioned by the current regime in Russia. The sanctions brought against me are a small sacrifice when compared to the threat currently faced by the people of Ukraine. Russia’s illegal occupation of Crimea violates Ukraine’s territorial integrity and sovereignty. Most troubling though, is its violation of the values of freedom, democracy and human rights — values Canadians and so many others have fought for, time and again. As a man of Estonian heritage, the current arguments and approach used by Russia to enter Ukraine are familiar to me. They are the same used to justify the Soviet occupation of the Baltics in 1939 following the Molotov-Ribbentrop Pact by which Stalin and Hitler carved up Europe. The Russian troops then moved into the Baltics, Stalin said to “protect” a Russian minority, to defend legitimate traditional interests in what was once part of a Russian empire, to take on local fascists, and in response to local demands. Now, 75 years later, the propaganda to justify Russian military occupation and expansion in Ukraine is identical. Troubling for the Baltics in 2014 is that some of the same rhetoric is being aimed at them from Russia today. My roots and the experience of my family have taught me that democracy and freedom can be easily lost and must be vigorously defended. It is the driving force behind my becoming involved in politics. It has been one reason why I have been actively engaged in our government on responding to this issue and Russian aggression. However, regardless of one’s roots, it is clear that members of the Conservative government, including Prime Minister Harper, and Foreign Affairs Minister John Baird, approach this issue from a principled position of acting to defend freedom, democracy, human rights and the rule of law. I am proud of Prime Minister Harper’s leadership in working with our allies to suspend Russia from the G-8, and to demonstrate a strong united front against Russia’s reckless aggression. The only way Ukrainians can be defended against this aggression is through sound determination by those who really believe in, and are willing to defend, freedom and democracy. Our government has taken a lead in that regard. I wish every Canadian could see what I’ve seen at numerous international national summits, specifically, the way our prime minister commands a room. Now, as the senior statesman of the G-7, his arguments lead the way. In this particular crisis, it is no secret that Canada’s arguments have been a catalyst for action. Critically, we have recognised the importance of using our leverage to bring allies along, resulting in a stronger and more unified response. Canada’s public has also demonstrated strong support — among the strongest in the world — for the firm response provided by its government. We need to ensure we do not see the same type of Russian violations to human rights and democracy that have occurred in the past. Our government will continue to stand with our allies and condemn Putin’s military intervention in Ukraine.